We fixed our truck and set out again but didn't get far. The road is winning; our truck broke down again. Running low on water, we walked down the road to find the next village. 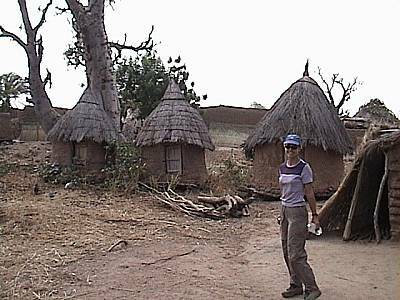 We found it a few kilometers down the road, a small settlement of fifty people in mud huts with conical thatched roofs. We're lucky to find a place so close. The villagers, smiling, curious, seemed eager to help. We filled our water bottles at their well, trading old clothes for the water. An overcast sky shielded the sun and a stiff breeze blew dust in our faces but kept us cool. By midafternoon the crew had fixed the truck and after another four hours of jolting, bum-bruising driving we reached the first outpost of civilization. A town with a posted name, Diema, that had an outdoor bar and market. The townspeople stared at us, some smiled. One man tried to sell us a goat, obviously a hot item in this town. We took the goat for a test walk but didn't buy. We were lucky to find this village only 3 kilometers from where we broke down. 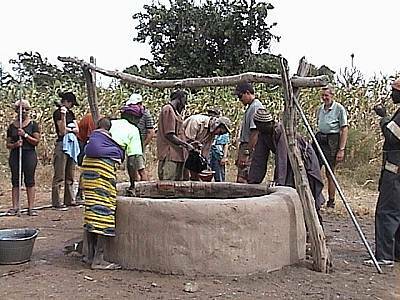 We filled up with much needed water from their well. Then we carried some water back to our truck in jerry cans. The villagers must have been amused: it took nine Western people to carry three jerry cans of water. 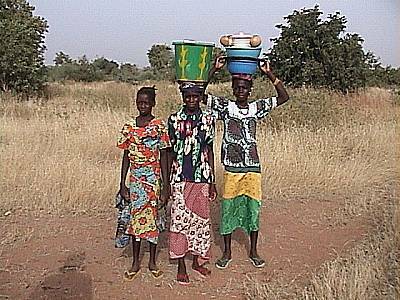 Three local women would have carried the same amount of water on their heads.